Here’s a blog that has nothing to do with railroads, but maybe a few readers will find it of interest. Obviously, I love railroads, but I have other interests, including –history, conservation of and enjoying our Nation’s National Parks, National Forests and other public lands, fishing, baseball, golf …and…football. I think the NFL and college football are national treasures in their own right. However, there are a few things that I don’t entirely like in the NFL that could be addressed if the leagues wanted to make the game great again. I really became an NFL fan as a small kid in Houston. I grew up almost obsessed with the Houston Oilers. The time I think the league may have been the greatest was in the late 1970s. It really sucked having someone take my team away. Below are 10 things that I think could get the league headed back towards greatness. No domed stadiums, period. Football (and baseball for that matter) was meant to be played outside. The weather is an integral part of the game. The new L.A. Rams stadium is proposed to have a dome!!! In LA?! No, the league should dictate right now, that there shall be no more dome stadiums. Henceforth, any time a community put more than 10% funding toward a stadium, the ownership of the name of the team shall be transfer to the city. No exceptions. Henceforth, any time a community puts more than 25% funding towards a stadium, the minimum length of time that the team shall remain in that city is 25 years. No exceptions. Other than the Dolphins, no color even remotely resembling teal shall be used as a team color. Nike should be banned as a uniform supplier immediately. What Nike did to the Buccaneers and Browns uniforms is reprehensible. The leagues should seriously consider having each team’s uniform go back to the uniforms they had around 1978. Three exceptions–(1) the Patriots could change their home jersey to blue if they so desired, but they must resume using Pat Patriot on the helmet, (2) the New York Giants can keep today’s uniform over their 1978 uniform. (The NY looks much better on the helmet than Giants spelled out. ), and (3) the New York Jets can keep their current uniform. It is vastly superior to the 1978 uniform which also had “Jets” spelled out on a green helmet. Now, this is really far fetched but I might as well come clean…I would direct two team movements and two name transfers. (1) I will catch grief from Jacksonville, but I would move the Jacksonville Jaguars to Phoenix (and drop teal from their uniforms!) and move the Phoenix Cardinals to Saint Louis. (2) I would direct Tennessee to give Houston the name “Oilers” back should Houston wish to ever change the name of the Texans. (3) This may really be too much… I would have Indianapolis offer to give Baltimore the name “Colts” back. Baltimore may prefer Ravens but at least the offer should happen. The names of teams should generally belong to cities and the fans. It is just the right thing to do. I would raise the barriers to letting the Raiders and Chargers to leave their cities. I know teams need to move occasionally, but it should only be in truly extraordinary circumstances. Restore the point after line to the 2-yard line. It’s hard to get a touchdown. There’s nothing wrong with a fairly easy extra point. If it served the game well for a few decades, why change it? Dump the color rush uniforms. They are gimmicky. I do strongly support the safety enhancements in the game. The long-term health of the players is very important. The recent article on Mark Gastineau is sobering. In my book, these 10 changes will go a long way toward enhancing the game and helping me feel like all is mostly well in the NFL. 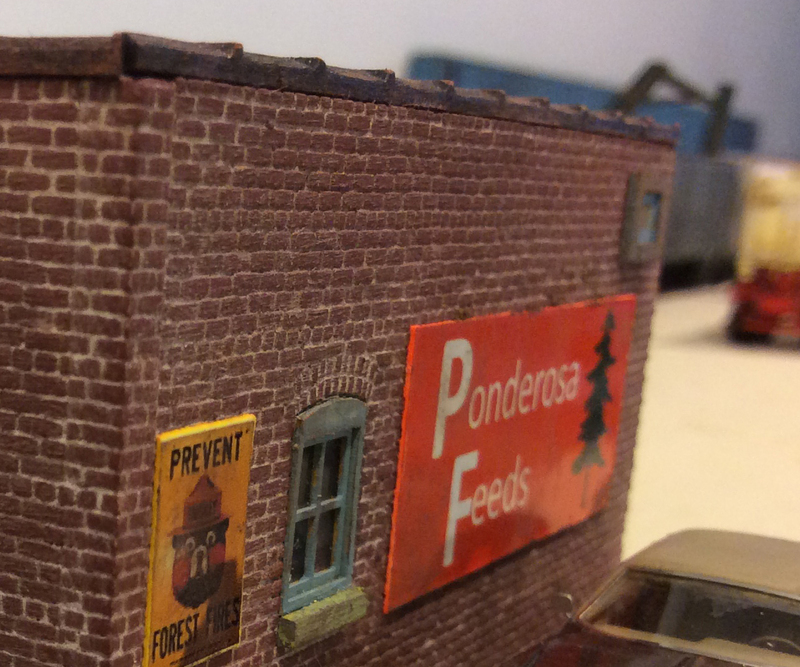 Ponderosa Feeds has now begun operations in Carrizo Springs. It took over an old tool shed built by the CB&Q in the 1930s. It has minimal infrastructure–an office, a couple of augers and a few delivery trucks. I like it because it can generate a lot of traffic without a lot of fussy infrastructure. The trucks load, make a delivery and then return. The Trinidad-Carrizo Spring local runs every 2 or 3 days, so that generally gives the crew adequate time to empty the spotted covered hoppers. The office is Monster Model Works’ new Brick Engineers Tool Shed. Monster Model Works produces excellent kits. 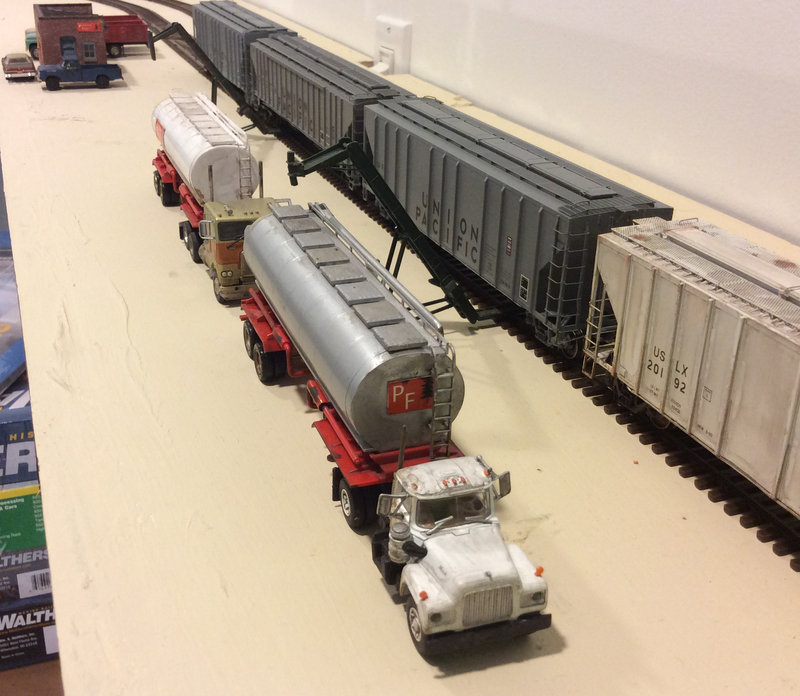 Many more will appear on the Rails West layout in the future. Jimmy Simmons, the owner of Monster Model Works, does a great job with his manufacturing and instructions. While not beginners’ kits, they do assemble pretty easily for anyone with a little experience–and the results are fabulous. I am very pleased with this kit. It is the perfect small office. If you haven’t tried any of Jimmie’s kits, you are missing out. Now the augers were a bit more of a challenge. 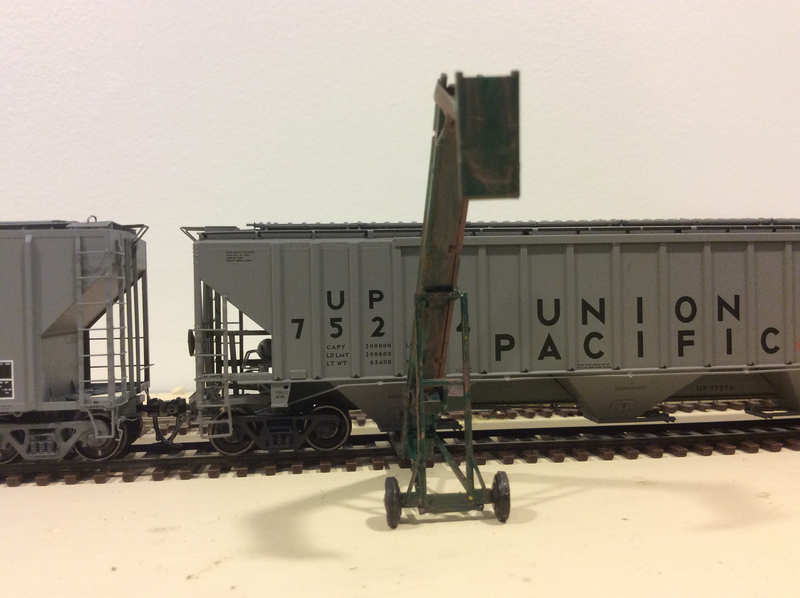 Following B. Smith’s lead, these are slightly kitbashed from Walthers Old-Time Coal Conveyor (Walthers Part # 933-3520). See my earlier posts on augers for more. They are not perfect but are a good stand-in for an auger to support an operation of this sort. 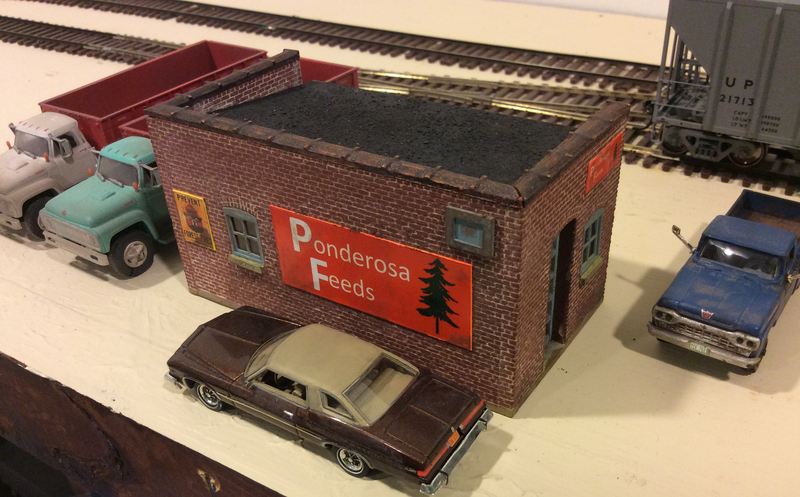 Ponderosa Feeds will provide a pretty consistent shipper for the railroad. Generally cuts of three to five cars are delivered. Since the augers are mobile, you don’t have to have a long lead so all the hoppers can dump into one bin. That is a real space saver for the layout! 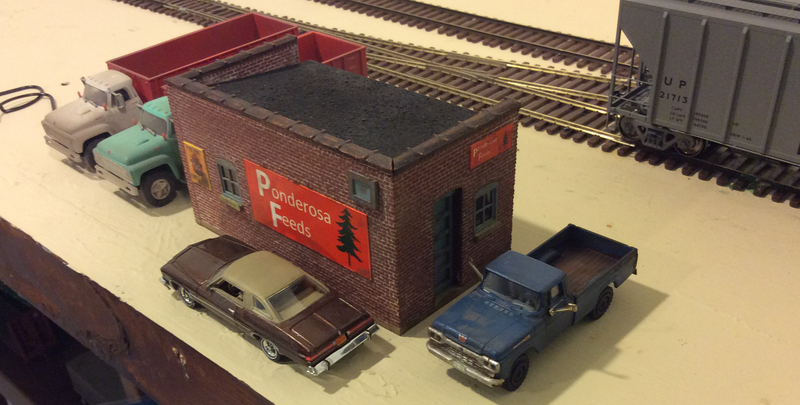 Keep an eye out next time you are in Carrizo Springs to see what’s going on at Ponderosa Feeds! Below are a few items related to the layout and subject matters of the layout. I completed an up-to-date map and narrative of the layout to reflect the new developments. The Rails West layout has a rich narrative that is immensely helpful to me, provides a degree of plausibility and helps the visitor get what they are seeing. 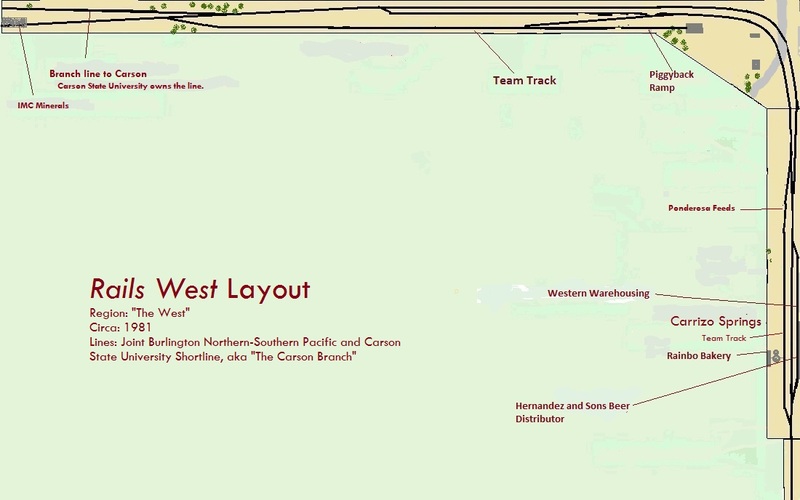 The Rails West layout is not designed to capture a specific place or in a sense a specific railroad. It is specific as to an era. It is unequivocally 1981. It is also equivocally set in the American West. It is a collection of some of my favorite scenes and memories during my time of living in and traveling across the American West in NM, W. Texas, CO, OR, WA and NV. 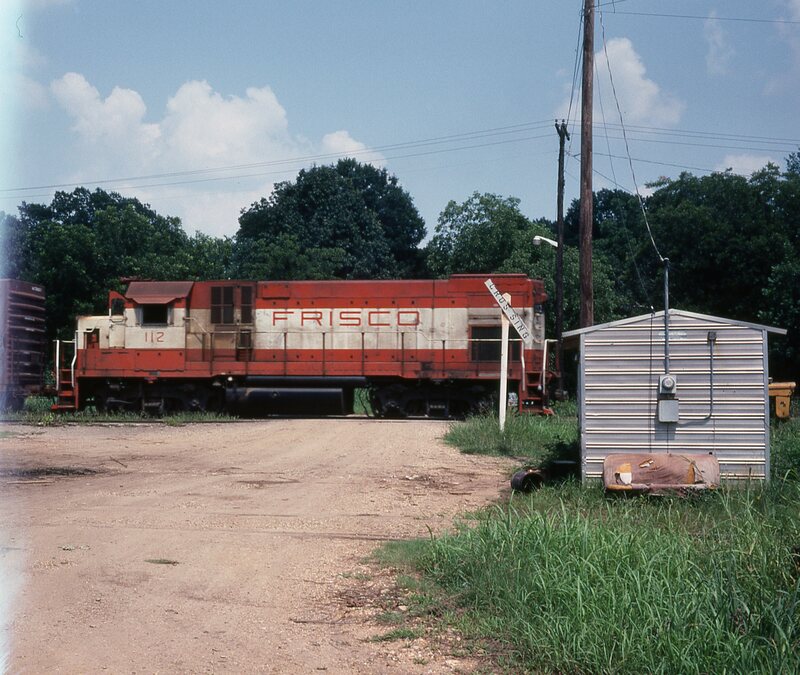 I also attempt to somehow plausibly connect to favorite childhood memories of chasing the Frisco in SW Arkansas (1977-80) by exploiting the BN/SL-SF merger. (I spent some summers growing up in Arkansas.) It is designed to evoke a special region at a landscape scale versus modelling a specific locale. The created history features a semi-plausible story that is “good enough” to permit me to run the equipment of two (actually three) of my favorite railroads and plenty of BN predecessor cars, including the Frisco. 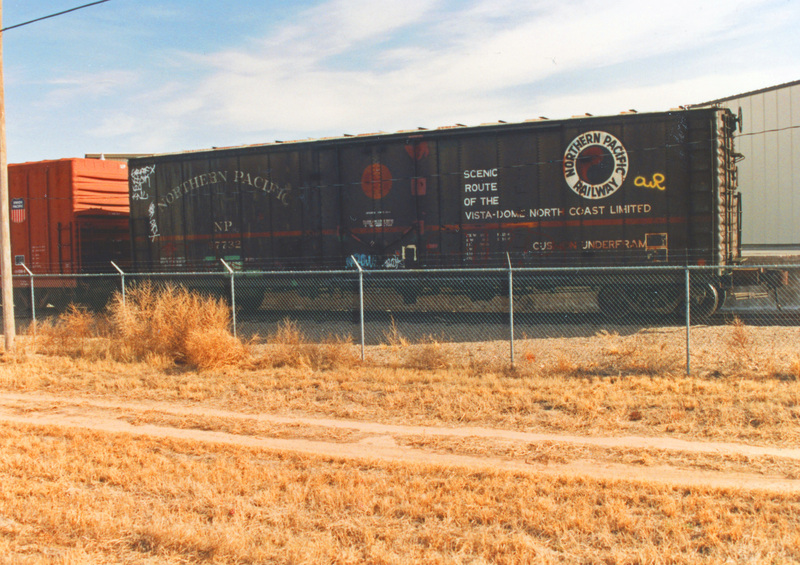 The “history” of the line is that for years the Chicago, Burlington and Quincy and Southern Pacific ran almost parallel lines across the Carrizo Valley and beyond. In the 1930s, the two companies decided to selectively abandon portions of their lines and create a joint line between Trinidad and Carrizo Springs. The CB&Q line continued west to Asherton and the SP line ventured on to Carson and a bit west to a mine at Mina. By the time of the Burlington Northern merger in 1970, the SP had sold the branch line to Carson to Carson State University after a large sawmill on the line had shutdown. It was a beautiful line that went from almost desert country well up into the green Carson foothills (and Carson National Forest) but difficult to justify operating due to slow track speeds and lack of traffic. The CB&Q had long ago abandoned the line to Asherton. Hence, what we find in 1981, is a joint BN-SP line from Trinidad to Carrizo Springs (and a bit west). Carson State University operates the Carson Branch from just west of Carrizo Springs to Carson. The University originally acquired the line to ensure the campus boiler and power plant had access to coal and that the campus commissary operations could continue shipments as needed. (CSU can operate it effectively as a non-profit and a classroom for its robust Civil Engineering program.) In 1976, the large sawmill partially resumed operations so the University found itself hauling some lumber traffic. 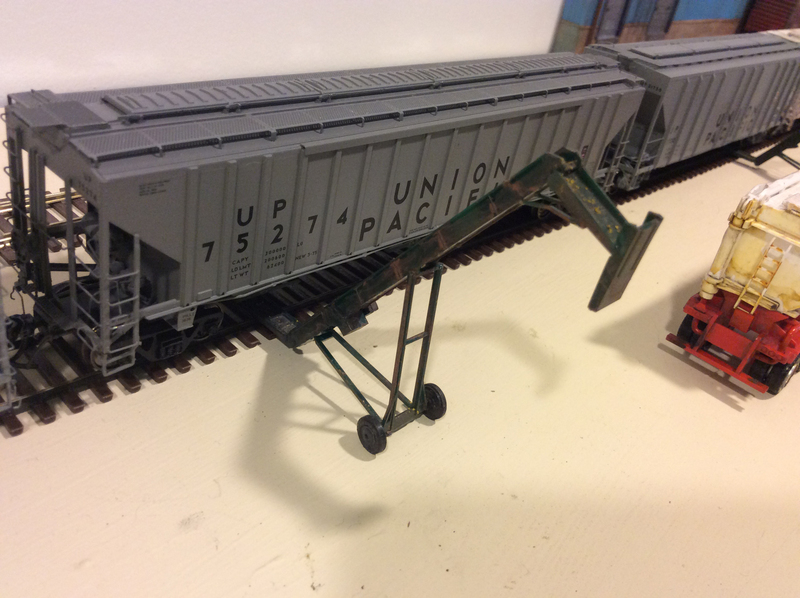 Flatcars, lumber boxcars and wood chip hoppers also appear in interchange for the “CSU” line. In 1979, the “CSU” line also agreed to service the IMC mine just at the cutoff to the Carson Branch. As a result, BN-SP services technically stop at the occasionally used piggyback ramp west of Carrizo Springs. A department store, furniture store, building supply and a feed store further west in the valley still get piggyback loads at the ramp. 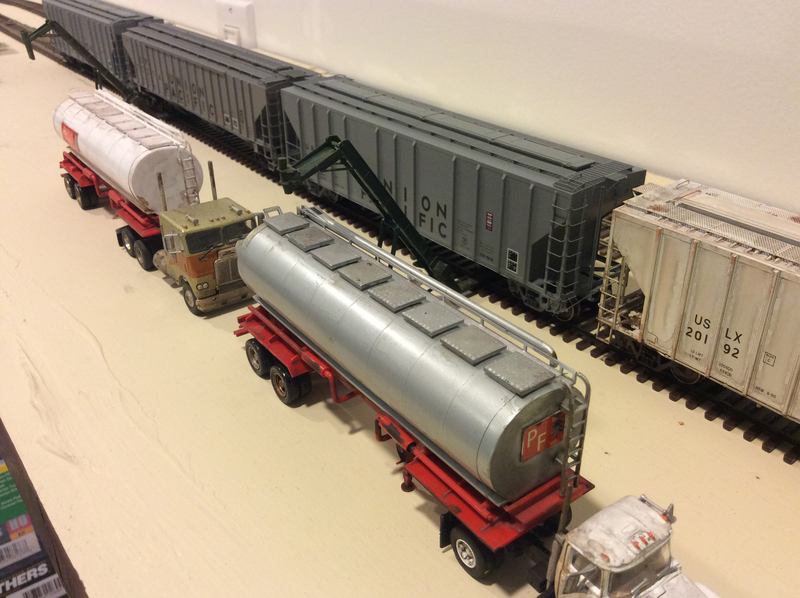 The layout takes place on the heels of the recent BN-Frisco merger, so some Frisco motive power and freight equipment grace the rails as well. This is the story of the Rails West experience! I attempt to capture experiences a lot of different ways. I try to capture businesses or even particular scenes special to me. Sometimes, the scene can be from a book. Page 95 of Southern Pacific Trackside in Northern California has a great picture of an SP GP-9 spotting a New Orleans Public Belt boxcar to “Maxco Supply” in Reedley, CA in 1990. I was taken by the scene and wanted to capture it with a newer 1981 version of the same car. 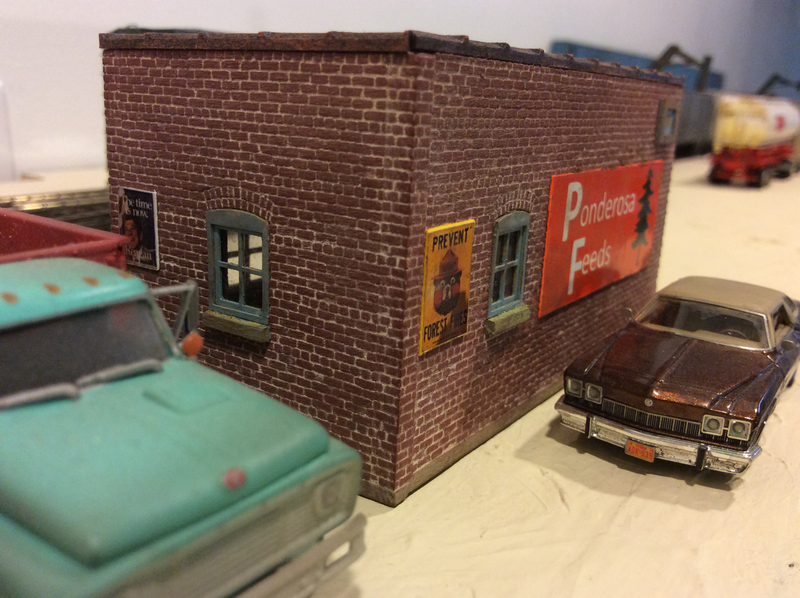 A new car for the Rails West layout. I wish I could include a copy of the photo from the book, but if you don’t own it, you probably should if you like the SP! I just got a copy. It is not quite as breathtaking as the Southern Pacific Oregon Division book, but it is pretty good. (In my mind, the Oregon Division book is a benchmark for rail-related books). Well, the augers are in place and servicing Ponderosa Feeds. I will post on this new customer very soon. Strings of covered hoppers loaded with cattle feed are now coming into Carrizo Springs! Happy New Years from Rails West!